My True Loves: Christmas Fun!! Wow, the holidays are always filled with great memories and this year was no exception! We went all over and traveled to see friends and family. Bella also had a Birthday but I will post about that later...now on with the show. First we had a great Christmas eve and day at Sam's parent house(his sis and bro were also in town). 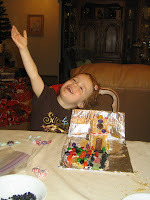 We made gingerbread houses and of course to Bella's surprise Santa really did fill her stocking! Then we visited our friends from Hawaii, the Barneys, it is so fun to catch up and reminicse(spelling?). They have the two cutest kids ever! Next we drove three hours up to visit my Uncle in Chico for a few days! It was so relaxing and as always they cook the yummiest food ever(like sushi & crab)! For New Years we went back up to the Joneses...and then the girls and I flew to Utah to spend a week with my family and Bella's cousins! So much fun to go sledding, it was Bella's first time and she LOVED it! Papa played pollypockets with Bella for hours, my mom took all the little ones to thrift shops and my sisters and I just got to hang out. I miss them already! I'll post pics from Utah later too. 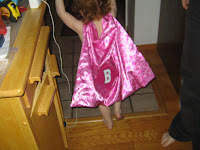 I had to show a pic of the Superhero cape I sewed for Bella! Didn't know I could sew did ya! Your girls smiles are contagous(sp?)! 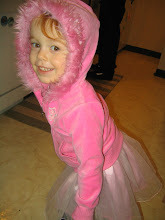 I LOVE Bella's cape - it is so cute and the fabric and design are wonderful... you should make them and sell them at a boutique... or e-bay (since you are the pro at that)! hey how you guys doing it has been a while. drop us a line when you get a chance. i know, so many pictures and things to post, so little time! looks like a fun time though! good job on the cape, she makes a great little super hero. Seriously, you have the cutest girls EVER!!! 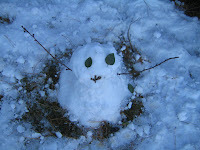 It was fun to see you at Christmas! 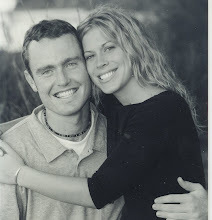 okay i was looking at heidi's blog and clicked on ice cream barrels and pretty sure those were your kids!!!??? your blog..i don't know a little confused, but then i found your real? 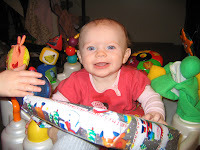 blog and your kids are very smiley and cute! glad you are doing better! Now you make capes AND birthday cakes!!! I'm so proud of you!! And Bella looks darling in it! Maybe she could fly to Utah with it one day!! 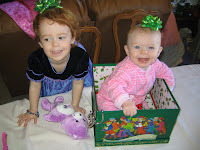 I agree about your two best presents, though...they are absolutely precious...and I'm not even biased! !